It's all about music, artists,their related stories, & all the music videos you hear on NRJ. NRJ MUSIC VIDEOS on MTV live @ 4:30 pm from Monday Till Saturday. 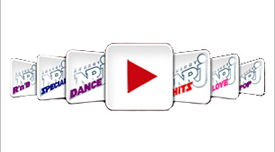 NRJ MUSIC VIDEOS, is hosted by CARINA KADDISSI. Are you more visual when it comes to songs? Do you like video clips?